"Thank you for making our wedding day so memorable. It couldn't be in a more beautiful place." "We had a beautiful day in a perfect setting. 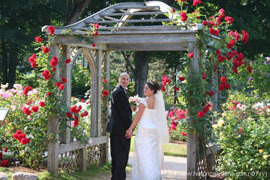 Your dedication definitely shows - the Gardens were wonderful." "Thank you for the opportunity to start our lives together in such a beautiful place." 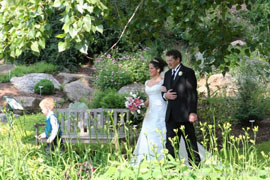 The Historic Gardens provide an ideal setting for your wedding. Our fee structure is flexible, based on the size of the wedding and any special requirements. Your wedding fee has the added benefit of providing all your wedding guests with full visitor privileges at the Historic Gardens while they are here. They may wander the Gardens either before or after the wedding at their leisure. Table & Chair, with white tablecloth for the signing of the marriage documents. 12 chairs for guests - for anyone who is unable to stand or for parents of the bride & groom. We have found over the years that most guests are quite happy to stand for an outdoor wedding and we encourage this for our weddings mostly because we have very few areas of the Gardens that will handle any more than a dozen chairs. Electricity if required for music, etc. Staff to set up and tear down the wedding site, take care of parking lots and to monitor your wedding to prevent accidental intrusion from unsuspecting Gardens visitors. Rehearsal is included in the fee and is highly recommended. Photo Location - it is assumed that you will be taking your wedding photos on site after the wedding and no further photo charge will apply. Site visit by Bride & Groom prior to the wedding to discuss exact location and needs. The exact location must be negotiated depending on other requirements (for example - power source). The booking Fee of $100 is payable at the time of booking and is non-refundable. Payment of the Guest Fee is required prior to the wedding ceremony, either at the rehearsal or earlier if you prefer. This fee is refundable under most circumstances. If the wedding is cancelled or moved to a different location (off site), we require notification at least 3 hours before the wedding time. If notice is not received at least 3 hours prior to the wedding, you will be responsible for the direct costs incurred for staffing or other unavoidable expenses. The Elm Tree Café is located within the Historic Gardens and is available to cater on site receptions for smaller weddings (maximum 75 people). If you are interested in discussing arrangements, please contact us at admin@historicgardens.com or (902) 532-7018. If you get married elsewhere you may wish to have your wedding photos taken in the Gardens. The price for this is $75.00 (plus tax) and includes admission for the wedding party and family (anyone directly involved in the photo session). Prebooking is advised. Download the information on this page as a PDF.